"Sampath Speaking" - the thoughts of an Insurer from Thiruvallikkeni: Tim Seifert takes wind out of Indian sails ! India has not done well in New Zealand, especially in T20s and the woes added up today with a worst defeat ! I had just posted on Sri Lankan injuries – especially at the hands of Aussies. If one thought Dimuth Karunaratne replacing the injured Kusal Perera, followed by a hit wicket was bizarre, you ain't seen nothing yet. According to Sydney Morning Herald, it turns out there have been two other occasions - both involving West Indies batsmen against Australia - when a batsman retiring hurt has been replaced by a batsman who had retired hurt. Back home, in the Ranji finals – Vidarbha tightened their hold on retaining the trophy. The score card reads : Saurashtra 307 and 58 for 5 (Vishvaraj 23*, Makvana 2*, Sarwate 3-13) need another 148 runs to beat Vidarbha 312 and 200 (Sarwate 49, Dharmendrasinh 6-96) ~ with half side back, it is unlikely that they chase and score another 148 with the bowlers .. .. something unimaginable, something what Aussies had struggled in the recent tour happened – last ball of the ninth over of the Saurashtra second innings. Cheteshwar Pujara leaned forward to defend a flighted delivery from Aditya Sarwate on off and middle. He played for the turn from the left-arm spinner, but there wasn’t any, he was trapped plumb in front for a five-ball duck. After picking up five wickets in the Saurashtra first innings, Sarwate winkled out three top Saurashtra batsmen inside nine overs, leaving them 22 for three in a chase of 206. Morning as I was searching TV channels for India T2o, there was live coverage between NZ Vs Indian (women) .. Mithali Raj was dropped from India's starting XI for a second straight T20I, in the series opener against New Zealand in Wellington, their first match in the format since her controversial omission from the XI for the semi-final of the World T20 in the Caribbean late last year. Then, like in that semi-final against England, Smriti Mandhana helped India get off to a promising start, this time in collaboration with Jemimah Rodrigues, after which they suffered a collapse. In Wellington, on Wednesday, Mandhana smashed the fastest T20I fifty for India women, surpassing her own record, before the side lost nine wickets for 34 in a chase of 160. The New Zealand fightback, sparked by a momentum-shifting catch by substitute fielder Hannah Rowe, was led by fast bowler Lea Tahuhu, wristspinner Amelia Kerr, and offspinner Leigh Kasperek. The score card read : New Zealand women 159 for 4 (Devine 62, Satterthwaite 33, Martin 27, Deepti 1-19) beat India women 136 (Mandhana 58, Rodrigues 39, Tahuhu 3-20, Kasperek 2-25) by 23 runs. When Tim Seifert was told he'd be opening in the first T20I in Wellington, he went and looked up videos. Not unusual, but then he didn't go watch his own videos or those of India's bowlers., reports Cricinfo. 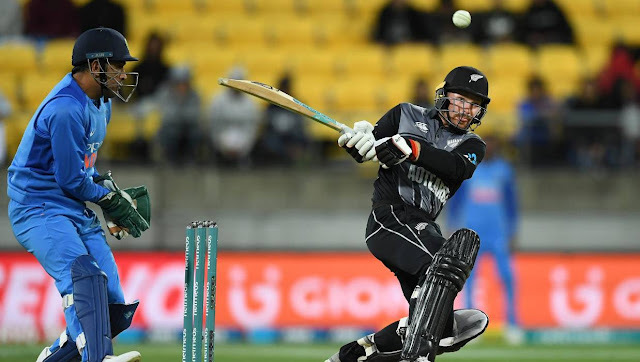 "Kinda funny when I got told that I'll be opening the innings," Seifert told Star Sports, after setting up New Zealand's 80-run win with an explosive 43-ball 84, "I YouTubed Brendon McCullum and watched some of his innings." In his post-match press conference, Seifert said he had watched quite a bit of McCullum growing up. Whatever it was, the defeat was ignominious .. .. margin of 80 in the first T20I at Westpac Stadium. Their previous worst loss was by 49 runs against Australia in the 2010 World T20. This was New Zealand's joint fifth-biggest triumph. It was also New Zealand's third-highest T20I total. Downunder, South Australia women were bowled out for just 10 runs by New South Wales in a second round match of the National Indigenous Cricket Championship - Women's Division in Alice Springs. Only four runs were scored with the bat, all of them by opener Febi Mansell. Below her, it was a series of zeroes, till 'extras' - six, all of them wides. Roxsanne Van-Veen's figures read 2-1-1-5, while Naomi Woods picked up two wickets in the only two balls she bowled. Concluding with the cricket injuries and the retired-hurt at Canberra, SMH reports that there have been two other occasions - both involving West Indies batsmen against Australia - when a batsman retiring hurt has been replaced by a batsman who had retired hurt. The last occurrence was in Kingston in 1991 when Desmond Haynes came back to replace Gus Logie. But it's the episode in 1976 that will leave you scratching your head. Opener Bernard Julien was the first to come to grief, replaced by Clive Lloyd who also retired hurt. Later, Julien came back to take over from an injured Michael Holding. Holding returned only to be dismissed hit wicket. Logie in that 1991 test was first injured in his toes, retired and then again was hit on the face – yet was joint-man-of-match in the drawn match. Read that West Indies paceman Alzarri Joseph’s mother died of a brain tumour during the second Test. Joseph, 22, learned the news on Saturday and played out the match, despite being given the option by captain Jason Holder of withdrawing, finishing with four scalps in the Windies' 10-wicket victory.